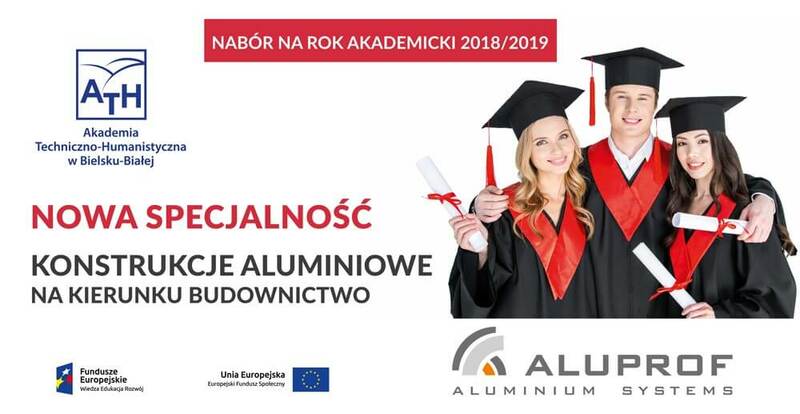 Aluprof is a partner for Construction major students | ALUPROF S.A.
By a decision of the Senate Council of the University of Bielsko-Biala the new major “Aluminium structures in construction” will commence starting from next year. This is a joint project of the University of Bielsko-Biala and Aluprof. This is the first major of such subject at a Polish university. Thanks to its indisputable advantages – lightness and strength – aluminium is used in the construction of buildings around the world. Aluminium systems are becoming increasingly more popular especially in modern, energy-saving and passive investments. For these reasons, a decision was made to create the major “Aluminium structures in construction” for Construction students at the University of Bielsko-Biala. Aluprof is the partner and co-organizer of the project. The company originating from Bielsko-Biała is one of the most important and largest manufacturers of aluminium systems in Europe. For several years it has been expanding its activities also in the United States, where it provides systems and solutions for the most prestigious high-rise buildings. Aluprof specializes in facade, window and door, roller shutter and many other systems. Experienced specialists working in Aluprof will share with students both theoretical knowledge and practical tips straight from the market. The company submitted a declaration of employing graduates of the new major and also carrying out joint diploma theses, student internships and study visits. The Aluprof laboratory will also be made available for the needs of students. “Cooperation with universities and involvement in the development of education is something natural for the Aluprof company. As an industry leader in aluminium systems, we want to share our knowledge, set new directions of developments, co-create valuable educational projects and also actively participate in training future professionals. Our involvement in opening a new major at the University of Bielsko-Biala resulted from the conviction that extensive knowledge of aluminium structures is today an essential and at the same time very useful element of education in the field of construction” said Bożena Ryszka, Aluprof Marketing Manager. The first classes will start with the beginning of the academic school year 2018/2019. The topics covered will include: aluminium and glass structures, statics, thermics and acoustics of aluminium and glass structures, calculation methods, aluminium systems in the future and smart buildings. The major was launched with funds from the European Union.